Casa Perla backs up against the spectacular Mayan Jungle! We have seen Toucans right outside the kitchen window, and dozens of Pink Flamingos, coming and going to name a few of the birds right out the back door. The house offers numerous viewing opportunities and a full roof top veranda, for breathtaking 360 degree views of the jungle and the sea. The state of Yucatan is home to 444 of the 547 bird species registered for the entire Yucatan Peninsula, which in turn represents 50% of all the birds reported for Mexico. The species are diverse in that they belong to 67 of the 75 bird families found within this region. Apart from the great diversity of species to be found in the area, the region's fame for endemicism in both its flora and fauna makes a visit to the Yucatan (incorporating the three states of Campeche, Quintana Roo and Yucatan) a "must" for enthusiastic wildlife viewers. Invaribly, such visitors are drawn to the state of Yucatan to view the only colony of American Flamingos in Mexico – numbering more than 40,000 individuals – and to observe the antics of the endemic Yucatan Wren, that predominately inhabits the north coast of the state. In addition, the state of Yucatan has traditionally served as the region's cultural center and is the perfect place to combine birds with visits to Maya archeological zones and rural communities, where bird watching is becoming popular among local nature guides. A breakdown of the composition of the bird species found in the state of Yucatan helps the visitor to select the best time of year to seek out birds in the area as well as gauge one's chances in finding specific, desirable species. The following, along with paying attention to the status symbol given for each species in the check-list, should assist the visitor, as well as local birdwatchers, to know when best to look for certain species. 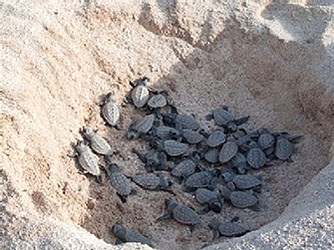 · 233 species are year-round residents in the state and are known to nest at least in the region, if not in the state of Yucatan itself. Of these, 27 species swell their numbers in the winter as they are joined by northern, migratory populations. Most of these species are water birds, including Brown Pelican, Anhinga, White Ibis and most heron species, in addition to the Osprey and Blue-gray Gnatcatcher. Two species, the Tricolored Munia and the hybrid Eurasian Collared-/Ringed Turtle-Dove, were introduced as a result of the international cage-bird trade. · 31 species are vagrants or accidentals to the region, in that the peninsula or the state is out of their normal range. · 14 species are designated as occasional to the region as they have been registered fewer than 5 times, but may be expected in the future. · 54 species are predominantly migrants that pass through the peninsula during fall and spring migrations between the northern and southern hemispheres. These are called transients and only a very few individuals of specific species have been recorded on the peninsula during the winter months. · 102 species, (in addition to the 27 species that also have local populations), are neotropic-neartic migrants that breed in North America north of Mexico and migrate to the peninsula, where millions of these birds establish their winter territories, much as repeat human "snowbirds" show up to rent the same house or apartment each year. Millions more of these birds also set up winter residence in Central America, passing through the peninsula to reach their final destination. · 9 additional species arrive on the peninsula from the Caribbean area and as far away as South America in the spring in order to nest here, returning to their points of origin in September and October. These include the Least Tern, Sooty Tern and Brown Noddy from the Caribbean; and from South America the Plumbeous Kite, Streaked Flycatcher, Sulphur-bellied Flycatcher and Piratic Flycatcher (rare in the state), as well as abundant numbers of Yellow-green Vireo. The Gray-breasted Martin that leaves the peninsula in winter distributes itself over a wider range, including other parts of Mexico. The state of Yucatan is home to 11 of the 14 endemic bird species found in the region, as well as many of the approximately 100 endemic subspecies, including Northern (Ridgeway's) Rough-winged Swallow. The endemic species include: Ocellated Turkey, Yellow-lored (Yucatan) Parrot, Yucatan Poorwill, Yucatan Nightjar, Yucatan Woodpecker, Yucatan Flycatcher, Yucatan Jay, Yucatan Wren, Black Catbird, Rose-throated Tanager and Orange Oriole. The Black-throated (Yucatan) Bobwhite is a quasi-endemic due to having a few disjunct populations, including one in Honduras. Another such species is the Mexican Sheartail, which apart from the north coast of the peninsula is only found in central Veracruz. The affinity that the coastal vegetation of the north and east coast of the peninsula has with the Caribbean region, provides habitat for birds from that region that are found nowhere else in Mexico. These include: Zenaida Dove, Caribbean Dove, Yucatan Vireo, and, unfortunately, of recent and interrupted intrusion, the Shiny Cowbird. The White-lored Gnatcatcher has an equally unusual distribution, found only in the north of the state of Yucatan in eastern Mexico, while also inhabiting parts of the west coast of Mexico and Central America. Every year, between the months of May and September, giant ocean dwelling turtles come ashore directly in front of Casa Perla del Mar to fulfill the last, crucial stage of their reproductive cycle: laying their eggs in the sand. The 3 types of turtles found along the beach front of Tankah Bay, and throughout Cancun and the Riviera Maya are the Loggerhead (Caretta caretta), the Hawksbill (Eretmochelys imbricata), and the Green turtle (Che-lonia mydas). The Loggerhead stands out for its reddish-brown coloration; it usually weighs about 140 kg (300 lbs). The Hawksbill has been hunted for its translucent carapace, used to produce tortoiseshell combs and other ornamental articles. It can weigh anywhere between 14 kg and 45 kg (30-100 lbs.). The Green turtle, so-called for its green body fat, usually weights between 45kg and 90kg (100-200 lbs). All of these oversized but beautiful and docile creatures are in danger of extinction, in spite of the many measures and laws the Mexican government and other international organizations have implemented to protect them. 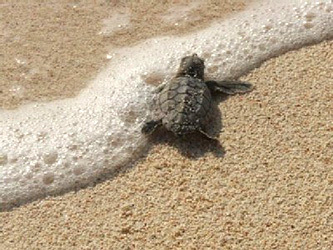 Locally, a great number of individuals, groups and even hotels are working together to help the turtles. 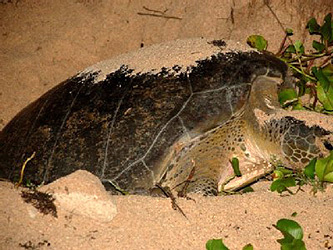 At nightfall, the mother turtle crawls ashore seeking a quiet spot on the beach. Once she feels safe, she begins to dig a large, fairly deep pit in the dry sand to complete her task. The egg-laying phase itself takes only about twenty minute. The eggs hatch, some fifty days later. It is estimated that the Loggerhead lays 160 eggs per nest (sometimes up to three times per season), while the hawksbill will lay 120 and the Green around 90. It is a perilous journey for these tiny creatures, and not many will make it. It is an incredible gift to have the opportunity to see this process.